3/4 style. Durable Soft leather and synthetic leather upper. 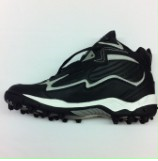 Molded rubber cleats.